Today, we're going to talk about how to freeze meat. Sometimes there is a great sale on one type of meat, but I don't have the time to prepare enough meals for all of it. These tips let me precook the meat to have on hand for when I'm ready to assemble a meal and are a great time (and money) saver! Some people don’t have the time to invest in a day of preparing several meals for freezing but still want to get the benefit of saving time and money overall by prepping some items for the freezer. Here are the Best Ways To Prepare Meat For Freezing that are not only simple to accomplish but truly time saving when meal prep comes around. No matter what your favorite meat is, these tips will help you save time and money during evening meal prep during the busiest time of the year. PRE-FORMED GROUND MEAT PATTIES: Whether it be ground turkey, beef or chicken creating pre-formed patties can be of great use when you decide you want a simple night of “throwing burgers on the grill”. Invest in wax paper to go between each patty for easy separation and either stack in airtight storage containers or lay flat and stack in gallon freezer bags. These are easy to use just one or two at a time as needed. Form them thin enough that they can go straight from freezer to grill or pan without having to thaw. BROWNED GROUND MEAT: Buying ground meats in bulk can almost always provide you with the lowest overall price. Rather than freezing the entire package whole, grab your largest stockpot and brown the whole 5lb or larger batch at once. Season lightly with salt, pepper or season salt and allow it to cool after cooked. Spoon by 2 Cup portions into quart freezer bags and freeze lying flat for easy stacking. These are great to grab and toss into chili, season for tacos or for enchiladas or even soups or Sloppy Joes. 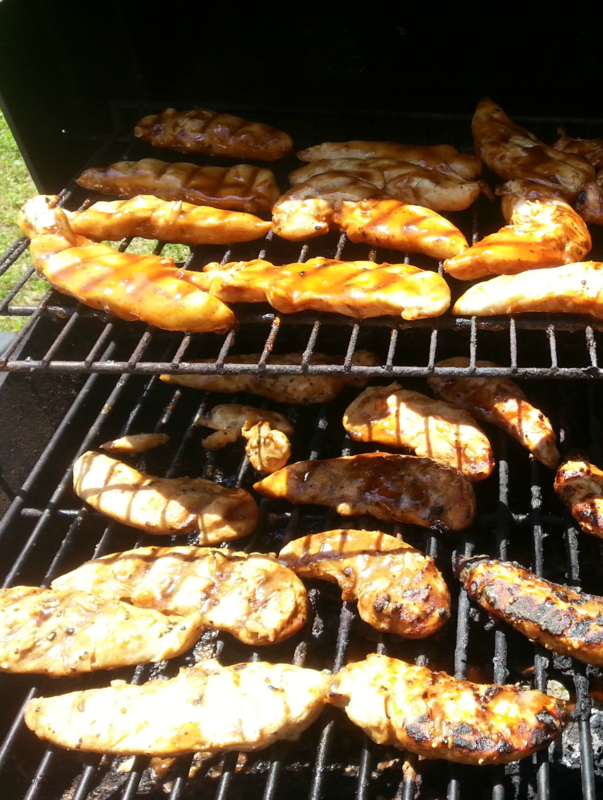 GRILLED MEATS: Find a great deal on boneless skinless chicken breasts or thighs? Toss them into a quick marinade and grill the whole batch at once. Grill 5-10lbs of meat at once and portion into gallon freezer bags. Grab out the number of pieces you want for a salad, sandwich, pasta dish or taco and simply thaw in microwave and then reheat as desired. Time saving and a great healthy option that will give you a quick and easy healthy protein to go with any starch or vegetable you have on hand. 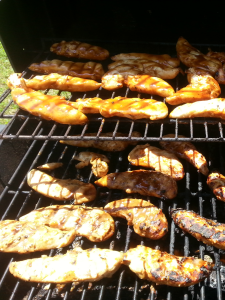 Steaks, Pork Chops, Turkey breasts and ground meat patties can all also be grilled in advance easily. BOILED BONE IN CHICKEN: If you prefer the extra flavor of having bone in chicken on the grill but are always afraid of the meat being fully cooked, pre-boiling the meat and storing in the freezer until ready to grill is a great way to go. Lightly season the water with salt, pepper, garlic and onion and boil in large batches. Allow to cool then store in gallon freezer bags and pull out as desired only 1-2 pieces or the entire package. These are great to thaw overnight in the refrigerator, coat with BBQ sauce and toss on the grill for a few minutes to go along a quick potato dish and favorite veggie. SHREDDED ROASTED OR BAKED MEATS: Toss a roast, pork loin, chicken or turkey in the crockpot or oven and cook until tender and falling off the bone. Shred the meat and portion into 2 cup portions in quart freezer bags and store for quick pasta dishes, sandwiches, tacos and more. These are just a few of the best ways to prepare meat for freezing that are easy and commonly used. Use your imagination and work with what your family typically eats to decide the best choices for your own freezer meat prep. Using these methods when you find select meats on deep discounts like the annual turkey closeout deals are great ways to save time and money. That's why learning how to freeze meat can be such a great idea! 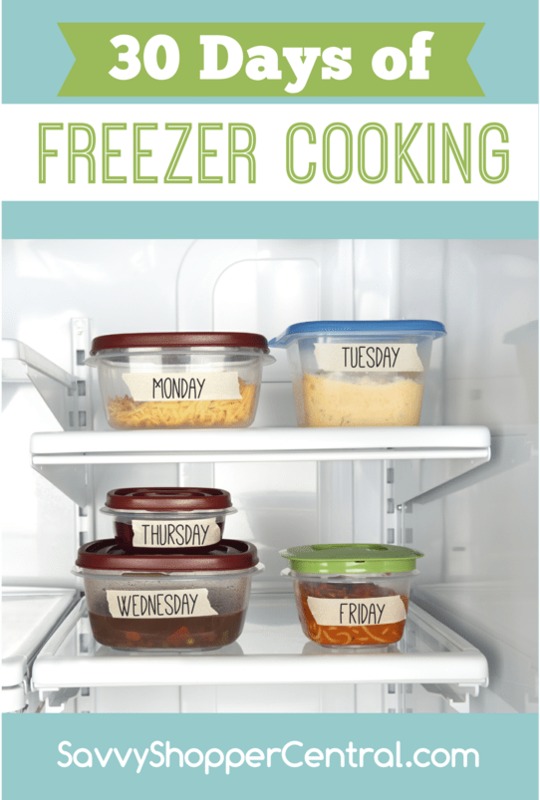 Don’t forget to check out the rest of our 30 Days of Freezer Cooking series!